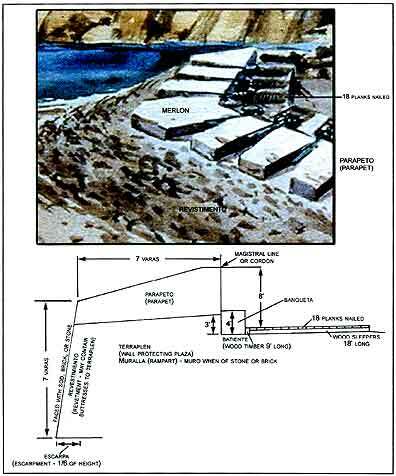 It is the primary purpose of this report to present structural facts, findings, and deductions from the 1981 through 1995 archaeological excavations at the site of the old Spanish Fort Guijarros at the base of Ballast Point, Point Loma, San Diego. The fort was authorized by the King of Spain and in 1796 was constructed on Punta de los Guijarros, literally Cobblestone Point, in San Diego. Spanish planners selected this site at the mouth of San Diego Bay for a cannon battery which could effectively defend the Royal Presidio de San Diego from enemy invasion. The fort was originally dedicated and named San Joaquin. No Spanish or Mexican maps, drawings, or records have yet been found to describe the appearance of Fort Guijarros; however, an 1851 United States Coast Survey Map of Ballast Point provides strong evidence of a three-sided chevron-shaped battery (Figure 9.1). Figure 9.1 United States Coast Survey Map showing shape of (ruined) Spanish Battery, 1851. By A. M. Harrison. 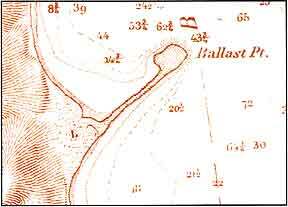 Also, an 1867 United States Army Corps of Engineers’ Map of Ballast Point suggests location and orientation of the battery (Figure 9.2). 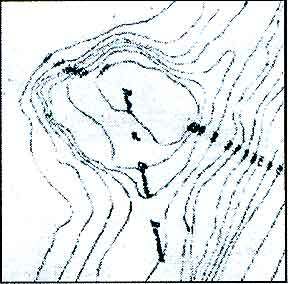 Figure 9.2 Topographic contours of ruins of Spanish Battery. 1867 map by Thomas H. Hanbury. In the absence of Spanish plans or engineering designs for Fort Guijarros, there is indirect evidence of the fort’s general shape and design in existing plans and sketches of Spanish cannon batteries in Nootka, British Columbia and San Francisco, California. Other indirect evidence of design can be drawn from the 1772 writings of de Lucuze. Based on historic and archaeological evidence, artist Jay Wegter created a painting of what Fort Guijarros might have looked like in 1800 (Figure 9.3). Figure 9.3 Top: 1 and 2 show fort cross-section before and after removal of the parapet walls. 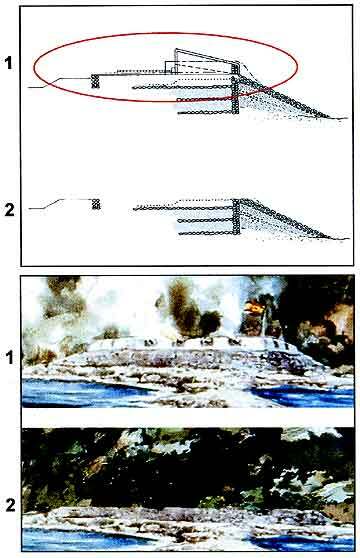 Bottom: These illustrations show a portion of Jay Wegter’s watercolor Battle of San Diego Bay depicting (1) a hypothetical view of Fort Guijarros and (2) the fort with the removal of the upper walls. At the site of Fort Guijarros, the uppermost portion of the remains is likely the eroded parapet of the structure. It is possible that whalers using the site in later years may have altered this area, but it is doubtful they would have reduced this elevation significantly. 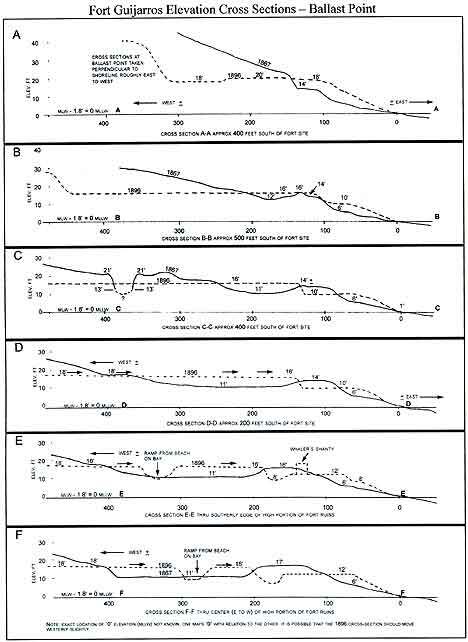 Therefore, allowing for a small error in the surveyors' established zero elevation of MLLW, 17 feet is thought to be the elevation of the eroded parapet fill after salvage operations removed the tile and stucco protective cover (see figure 9.3). This demolition was probably a combination of Juan Machado removing usable tiles and wood under a Mexican salvage permit in 1840, later whalers clearing the site of debris, and the 1853 contractors who salvaged tile for re-use in the U.S. Lighthouse atop Point Loma. Furthermore, the cobblestones contained in the Fort Guijarros revetment to fend off high tide and surf erosion would have made a handy source of ballast for the many ships doing business at the adjacent Port of San Diego. 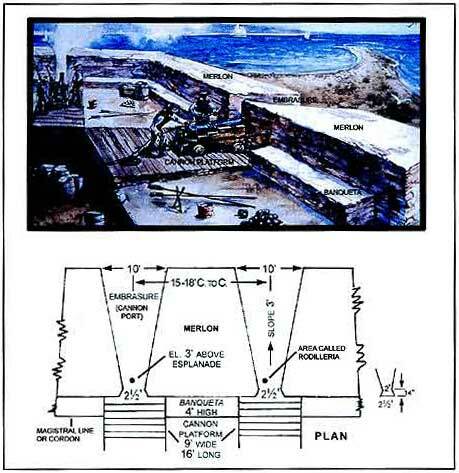 The 1896 U.S. Army 1-Foot Contour May by Lt. Deakyne is a plan for construction of what was then a state-of-the-art coastal artillery battery, Battery Wilkenson. This map, when compared with the 1867 map, shows the work begun by the Army in 1873-74 in preparation for construction of a Coastal Cannon Battery. In 1894, Congress stopped their project due to advances in European artillery. 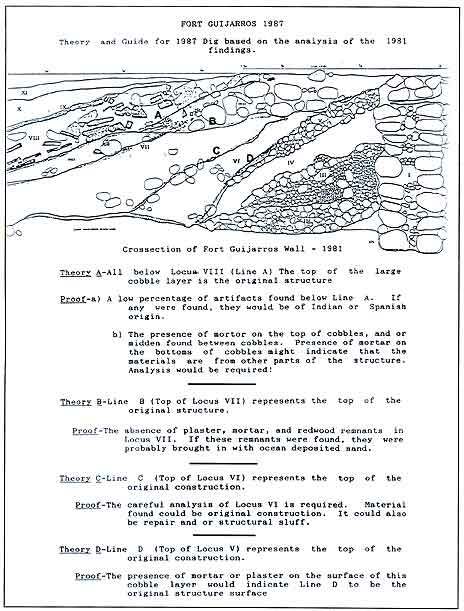 This 1896 plan reveals the fact that considerable work was done in 1873 to construct the earth pad for the Cannon Battery, leveling higher ground for sight and firing clearances. The old Fort Guijarros site with its uppermost ruins at 17 feet above MLLW was lowered to about 12 feet above MLLW. Therefore, it is concluded that not only has old Fort Guijarros lost its 7-to-8-foot parapet walls to salvagers and site-clearers, but also several feet of the overall fort construction due to Army Corps activity. In the 1981 archaeological excavations, it was determined that the 24.36-to-27.6-inch-thick cobblestone muro (core wall of the fort) and the stone, earth, and sand revetment structures seaward of the core wall were all founded on the beach (Figures 9.4 and 9.5). The bottom of the wall was found at 0.68 feet above MLLW, while the top of the remaining wall was found at 11.46 feet above MLLW (1981 determination). Figure 9.4 Layout of Fort Guijarros excavation Fields I, II, III, IV, V, VI, VII, and VIII in the vicinity of Building 539, Rosecrans Street and Battery Wilkeson. Note cross-section A-A at bottom, which shows the distinction between the present surface parking lot and the historical surface of the ruins of the fort in 1867. 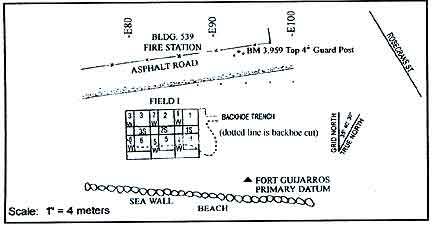 Figure 9.5 Cross-sectional views A-A, B-B, C-C, D-D, E-E, and F-F showing points along the beach at Ballast Point in relation to Fort Guijarros based on Thomas H. Hanbury’s Army Map dated 1867 and Lt. Deakyne Map dated 1896. Some elevation could also have been lost during the Navy’s paving work after the 1981 dig. The elevation of the top of the wall is reportedly 9.89 feet above MLLW. What remains of old Fort Guijarros is therefore the bottom 10 feet of an earth, sand, and cobble substructure which once stood at an elevation of some 21 feet above MLLW at the uppermost height of its 8-foot earth, adobe, tile, and stucco parapet. On top of the eroded original revetment layers lay the ruined remains of the upper 10 or 11 feet of Fort Guijarros, where they lay after being demolished and pushed or eroded over the seaward edge of the fort. Excavation and research to date allow reconstruction of a probable cross-section of the fort. It is clear from the 1987 examination of exposed features that the parapet could only have been supported by the core wall and the esplanade substructure of cobblestone mats, sand layers, and compacted earth fill. The revetment substructure seaward of the core wall does not appear to have any footing capability for superstructure such as a heavy fort parapet. Specifically, the evidence is the fact that the horizontal cobblestone-and-sand-layered substructure was found to extend from the fort core wall back not only 7 varas supporting the parapet but on back to form the substructure for the esplanade. In front of the core wall the revetment layers buttressed the mud-mortared cobblestone core wall at one time to near the esplanade elevation. Figures 9.6 and 9.7 depict an actual cross-section of the fort ruins in 1981. Figure 9.6 Top: Portion of Watercolor, Battle of San Diego Bay by Jay Wegter. Bottom: Fort Guijarros cross-section with identification of structural components: Parapeto, Merlons and Embrasures (Cannon Ports), Revestimento or Glacis, Banqueta, Cannon Platform, Sleepers, Terraplen, Plaza, Cobble Wall, and Magistral Line or Cordon. Figure 9.7 Fort Guijarros cross-section with identification of elevations and dimensions of proposed fort components. Since 1981, the Fort Guijarros archaeological site was examined each year at selected locations by teams from the Fort Guijarros Museum Foundation. Eight test areas designated Field I through Field VIII were completed in this effort (See figure 9.4). Each field was subdivided into grids of 3.28 to 6.56 feet and hand-excavated in natural layers from surface to sterile; each grid and layer was coded in order to document location of structure and artifacts (Figure 9.8). 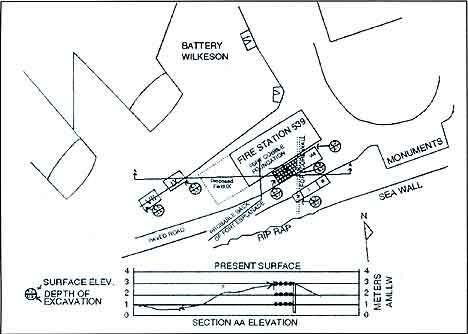 Figure 9.8 Map of Field I excavation units in 1981 south of Building 539, north of the sea wall. Spanish architecture of the fort was uncovered in a 16.4-by-29.53-foot excavation (See figure 9.8) revealing a design using various sizes of cobblestones, sand, earth, mortar, and both fired and unfired adobe. These materials were substitutions for the quarry stone, or coquina, traditionally used by the Spanish (Figures 9.8, 9.9 and 9.10). Figure 9.10 Illustration of fort components. (See figure 9.4) Excavation of a 9.84-by-9.84-foot area west of Field I provided information on the placement of the fort’s contrafuera or core wall, constructed of mortared cobblestones. This particular portion of the fort extends in a north–south direction. The southern extremities of the wall have been eroded and encumbered by recently placed rip-rap wall and waste concrete. It had been hoped to find evidence of the southerly facing fort wall, which probably lies beneath the rip-rap seawall. Spanish tiles, adobe, and mortar from the fort’s superstructure were reported. (See figure 9.4) At the east edge of Field I, Field III measured 16.4 by 29.53 feet, examining an area of Spanish beach for evidence of the 18th-century occupation. The old beach level yielded broken and water-worn Spanish tiles, rusted metal, bronze spikes, and an ornate brass rosette object. No evidence of occupation appears to have survived the seasonal storms that scoured the beach. However, tiles on sterile beach provide evidence of the easterly extension of Fort Guijarros. A 9.84-by16.4-foot area was examined west of Building 539, at the south edge of the earthen revetment at the 1898 United States Army Coast Artillery Battery Wilkeson. This search for evidence of the 1872–1874 American Army battery construction lead excavators to a depth of 6.56 feet, below which Spanish trash and artifacts were found. This suggested a barracks and kitchen in the fort plaza area with items dating from the late 1790s to early 1800s. At the southeast edge of Battery Wilkeson’s revetment, north of Building 539, excavation to a depth of 6.56 feet penetrated United States Army fill but failed to detect Spanish architecture. Negative findings provide strong evidence that Fort Guijarros’s architecture terminated directly under Building 539. Field VI. Excavation and shoring of a 9.89-by-13.12-foot area to 8.86 feet revealed Spanish architecture 100 feet north of Building 539. Although not primary elements of the Spanish battery, the artifacts found suggest the presence of the barracks and kitchen. Further west of Building 539 and Field IV, along the south side of Battery Wilkeson, Field VII measured 11.48 by 13.12 feet and was excavated and shored as a single unit to a depth of 8.86 feet. Artifacts such as Spanish floor and roof tile were recovered along with Spanish trash providing substantiating evidence that the plaza or parade ground area of the fort hosted workshop, kitchen, and residential activities. Located along the south side of Building 539, Field VIII measured 91.8 by 16.4 feet in size and exposed an excellent cross-section of the fort wall and overlying whaling and U.S. Army deposits. The cobblestone substructure of the fort’s esplanade or cannon operating area was exposed. The parapet area supported the merlons and cannon embrasures. The contrafuera or core wall of the fort traversed the width of the excavation, and a cobblestone revetment buttressed the massive clay-mortared contrafuera. Spanish tiles, mortar, stucco, whitewash, and adobe melt from the fort’s parapet covered the easterly down-sloping cobblestone revetment. Evidence suggests the merlons and parapet structure decomposed or were leveled by activity after the Mexican soldiers departed in 1835. Studies concerning the remains of Fort Guijarros use a grid system created for unit 5 in Field I, in which the square was subdivided into component subgrids with the intention of mapping in detail on large graph paper and analyzing each architectural piece in the field. As each layer of tiles were drawn and removed, another drawing was done on the lower layers until eventually all tiles were recorded and removed. A notebook of sketches with coded architectural observations was also created, providing both a graphic documentation and a field notebook that identified the tiles by the grid system, a description of the object, a sketch of the object, the code system, a list of notes and a photograph. Later on, the tiles were photographed again in the laboratory or returned to the field. 1. What documentation do we have for the shipment of tiles, wood, nails, cement, and other materials? What about the 40,000 tiles? 2. What documentation shows details of similar forts? a. From Historia de las Fortelezas de Santa Marta y Estudio Asesor para su Restauración by Juan Manuel Zapatero we learn that the parapet or merlon would be 7 feet high inside and 5 feet high inside and 13.5 feet thick. The rodilleras (cannon openings) are 2.5 feet wide and 11 feet 8 inches on center with the bottom of the opening and 3 feet from the esplandade (deck). Banquetas are 3 feet high between cannon openings for observation over the wall. b. From the same source, we see that in the Fuerte San Fernando, the merlon appears to be 5 feet wide with cannon ports 5 varas or 15 feet C to C.
3. Was our surveyor correct? a. In 1981, Butch Hancock, Land Surveyor used the term AMSL after the elevations recorded. This means Above Mean Sea Level, but, most surveys, including Army and the Coast and Geodetic Survey, were MLLW. The closest United States Coast Geodetic Survey monument is the “Coast Guard Monument,” which is recorded on MLLW, and is some 700 feet east of the Fort Guijarros marker. Field procedures consisted of the following seven steps: (1) Uncover all structures and clean them, starting with the wall; (2) Map and photograph; (3) Identify structural elements (tiles, cobbles, adobes, strata, etc.) with number system (catalog numbers) on the map; (4) For each piece, apply the Buchanan Code, i.e., A2 (BKLO) “fired adobe tile, 20 x 30 x 5 cm, broken size identifiable, mortar both sides, mortar impressions of mating cobbles, mortar impressions of mating tile;” (5) Start identification and coding system from wall working down over rubble as mapping is completed; (6) Draw and photograph significant structural pieces; and (7) Record all pieces on same 10 x 10 to 1 inch sheets as used by C. Fred Buchanan on previous excavations. Theory and Guide for 1987 Dig Based on the Analysis of the 1981 Findings. Codes A-D represent architectural strata in the collapsed portion of the merlon. The rubble of Strata 8 is designated as follows: Code A, brick rubble; Code B, cobbles, sea weed, and brick rubble; Code C, mostly sand and small cobbles; Code D, different colored sand and small cobbles lying directly on top of Strata B (which is believed to be the original architecture of the wall). 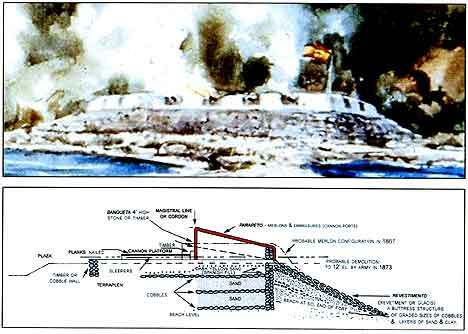 At the time this test procedure was designed (Figure 9.11) it was assumed that the surface of the glacis had been covered with mortar or plaster. Figure 9.11 Theory and guide for 1987 dig. Subsequent analysis in 1987 demonstrated that this was not the case. Hypothesis D proved to be correct, but without any mortar or plaster on the surface. This proof is based upon the lack of seaweed and rubble in Locus V. The studies presented here use a key of architectural codes (Figure 9.12). Figure 9.12 Fort Guijarros Architectural Codes that describe structural material found in the archaeological excavations. This article concludes with a series of three appendices. 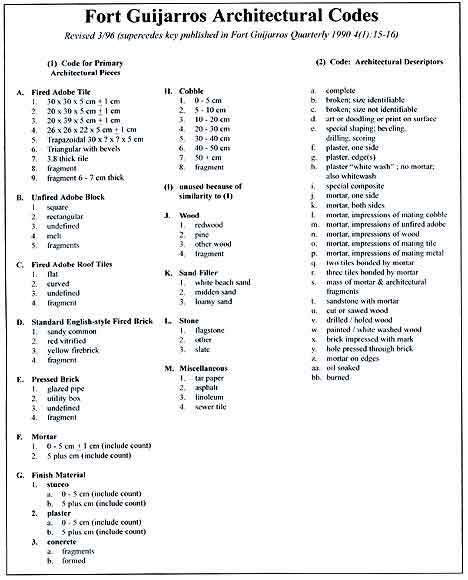 Appendix A provides a summary of items analyzed from 1981 to 1995. It serves a starting point for additional structural studies that further address the hypotheses regarding the construction of Fort Guijarros. Appendices B and C are additional structural analyses.